The operetta takes places in 19th century Serbia. Local men and women are meeting at Stakto's country inn between the towns of Gradinaz (Gradinac) and Raviza (Ravina), on their way to Jabuka. the annual apple festival. It is time for future grooms and brides to meet. When a boy is interested in a girl, he bites an apple and gives it to her. If the girl likes him, she also takes a bite. If she returns the apple without a bite. it is a no. Impoverished noblemen Mirko and Vasil from Gradinaz arrive in their carriage. They are hoping to solve their financial problems by selling their dilapidated castle to Bambora, a rich starch factory owner. In case the deal does not materialise. the brothers are ready to find themselves rich brides. They are the target of public ridicule for their poverty. To be served, they have to convince the innkeeper Staklo that they are able to pay. Staklo tells the two brothers about Jelka. the beautiful rich farmer's daughter who will surely appear at the festival. Joschko. a court bailiff, enters accompanied by his helper Franjo. Joschko complains about the hard life of a court bailiff. People would rather pay off their debts than have anything seized. He complains to Staklo about his bad day: he has seized nothing, except for a few old costumes which Franjo is carrying in a bag. Joschko's only hope are the two brothers from Gratinaz. Joschko meets Vasil and Mirko, who are worried that he may take their property before they can sell it to Bambora. Mirko distracts Joschko. while Vasil welcomes Bambora who has just arrived with his daughter, Annita. Bambora is bragging about his starch business, Vasil about his castle and the long line of distinguished ancestors. The men begin to play cards and all of them are trying to cheat. Annita talks about her wish to add a castle and a coat of arms to the starch factory. Mischa, the rich farmer enters noisily with his beautiful daughter, Jelka and her aunt, Petrija. He is upset as their carriage has broken down and they cannot get to the festivities. Jelka sings about being the beauty queen at the apple festival. Mirko admits he likes Jelka but she refuses him. He offers to lend her his carriage in return for a kiss. Jelka refuses. To punish Jelka. Mirko asks Joschko to put on one of the costumes he has seized, pretend he is a rich magnate, and take Jelka in his carriage to Gradinaz instead of Raviza. Mirko once again asks Jelka for a kiss. She agrees but only to a formal kiss. Mirko demands more and Jelka laughs at him. While Jelka is talking about Mirko's demand. Joschko arrives with the carriage and offers Jelka a ride to Raviza. She agrees readily and climbs up. There is room only for her and Aunt Petrija: her father Mischa has to walk behind. Women warn Jelka not to be too proud. Mirko is happy his trick is working out. and Joschko is looking forward to his promised reward and the seizure of the castle. Everybody is leaving for the festivity. At Mirko's and Vasil's castle in Gradinaz, the servants and others are demanding payment. They all would like to join the Jabuka but have no money. They threaten to stay until they get paid. Mirko arrives and invites all to join the festivity at his castle for free. For the moment, all forget their resolve and join in. Meanwhile Bambora and his daughter, Annita, also arrive at the castle. Mirko's plan is to pretend to Jelka that she is at an inn in Raviza. Vasil admits that he loves Annita and they sing together that happiness only exists where two hearts come together. Bambora admires portraits of ancestors and Vasil, in love with Annita, claims that even a painting of a fish represents his ancestors. Mirko makes final arrangements for Jelka's arrival so that the castle looks like an inn. Joschko enters, dressed as a magnate. together with Jelka, Petrija and the innkeeper, Staklo. Jelka is surprised by the unusual look of the inn and by seeing Mirko again. Jelka and Mirko have another argument. Finally Jelka is upset and demands a room for herself. Mirko takes advantagc of this and has her taken to his bedroom. Then he thanks Joschko for a job well done, but Joschko is mainly looking forward to seizing the property. Mirko does not stop him, he is only worried that somebody may see him placing a seal on his goods. At the end of the scene, Bambora returns. Vasil introduces to him Joschko as his uncle, the Count of Gradinaz, who is an antiques expert and is putting his seal of approval on various family items. Joschko acts his role of a magnate and claims the portraits of farmers are those of famous members of the family. Bambora is possessed with the idea that, through his daughter's wedding, he could gain the castle and a nobleman's title, and does not object to the relationship between his daughter and Vasil. To top it all, Mirko welcomes local farmers as his noble guests. Country people rejoice that food and drinks are free and entice others to come and celebrate Jabuka. Jelka comes out of her room and causes general displeasure, which she does not understand. 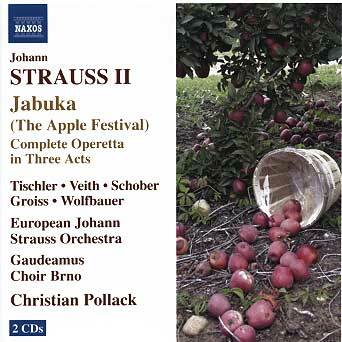 Joschko declares Jabuka: the Apple Festival has begun. and he hands out apples to the boys who give them to their chosen girls. Only Mirko gives an apple to Jelka, all the others turn away from her. The girls are dancing and return bitten apples to their boys. Vasil and Annita have already said yes to each other but Jelka, after a slight hesitation. throws her apple at Mirko's feet. Mirko takes offence but he still is interested in her. The others are laughing at her. The rich farmer Mischa, Jelka's father, enters. The truth comes out that Jelka was in Mirko's bedroom and that she is in Gradinaz instead of Ravira. Bambora is trying to calm things down. Joschko gets drunk on alcohol he has seized and tells the truth about who he is. Bambora gets upset and begins looking for his daughter to get her away from Vasil. Joschko is happy as he can finally seize as much as he wants. And on top of that, he has drunk well and has had a good tip. Jelka's father. Mischa, accuses Joschko of fraud. but then asks him to help to make up between Jelka and Mirko. Joschko will do anything for money. The girls are laughing at Jelka, telling her that she has to settle for a broom and engage in a mock dance with a broom. Mirko comes to her rescue and now both fall in love with each other. Another festivity starts: everybody is happy. and Johann Strauss delivers what is always expected of him, a great closing waltz.